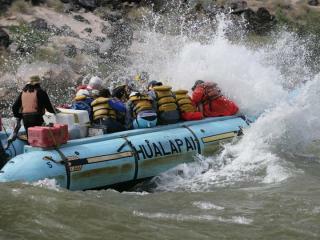 All Hualapai River Runner guides are fully certified and provide fascinating insight into the ever-changing waters of the Colorado River and the west rim of the Grand Canyon. Many of the guides have spent their lives learning the features of the river and are highly skilled at maneuvering the class 4 to 7 rapids guests may encounter along the way. Each raft will make a stop along the riverbank so that passengers may enjoy a nature hike and lunch. The 5.5 hour whitewater adventure wraps up at Grand Canyon West along the riverbank. Guests will board a helicopter for an exciting flight that ascends 4,000 feet through the canyon and lands at Grand Canyon West airport. After an action-packed day of adventure, passengers will return to Las Vegas with memories to last a lifetime! Daily, 15th March to 31st October including pick-up from Las Vegas Hotels. Departure times are around 6am but precise time will be informed at confirmation. Pick up from Las Vegas hotels will commence one hour before departure. All passengers wil need government issued forms of identification. Layered clothing is recommended through the months of March to September, and winter clothing should be worn from October to mid-March. The ground at the Grand Canyon is rough, rocky and uneven, thus it is important to wear sturdy, toe-covering shoes that can handle rough terrain. Sneakers or hiking boots are highly recommended. Don’t forget your camera! Cameras and phones are allowed and encouraged but please be aware that the use of "Selfie Sticks" and extending camera poles is strictly prohibited in and around the aircraft. All passengers booked on this tour must have government issued forms of identification. For Whitewater rafting you will also need some water proof shorts that dry quickly, trainers or river type sandals and a hat.